In what would have been an inconceivable turn of events twelve months ago, or even six, St. Louis Blues’ star goal scorer Vladimir Tarasenko is rumored to be available for trade. It is a testament to how desperate the Blues are and how stunned they are by their performance thus far that general manager Doug Armstrong would even consider moving a player with that much talent. With that said, there isn’t a team in the league who would not be theoretically interested in a player of Tarasenko’s caliber, all things being equal. He’s a premier goal scorer, top-five in the league in that category over the past four seasons, and the four seasons remaining on his contract at a cap hit of $7.5 million make his one of the better contracts in the NHL. Even with the Blues in “sell” mode and with his relative dip in performance, it would require a king’s ransom to pry him free from St. Louis. But there will be no shortage of bidders. Let’s take a look at some of the most logical possible destinations for him, in no particular order, and take a stab at what it might cost to get him. The Carolina Hurricanes have become one of the league’s more interesting teams, thanks in no small part to the public comments of owner, Tom Dundon. In the market for a sniper and not interested in defense, the Hurricanes might be a perfect fit for Tarasenko, and the two teams have been linked by Elliotte Friedman and others. What might the Blues seek in return from the Hurricanes? One assumes that Andrei Svechnikov, the star young scorer whom the Hurricanes selected second overall in this year’s draft, is off the table, although the Blues would jump at the chance. Beyond that, the Hurricanes have a bevy of interesting prospects, headlined by Martin Nečas, a 19-year-0ld Czech center who is considered one of the best prospects not yet in the NHL. Friedman wondered whether the Blues might be interested in Nečas, and there’s no reason they wouldn’t be. They have a strong young center prospect in Robert Thomas already, but no team can ever have too many centers. If the Hurricanes parted with Nečas, the rest of the package might be a number of picks and/or prospects. But there is another possibility. Given that team captain Alex Pietrangelo has found himself in the rumor mill, the Blues may be looking for additional help on the right side of the defense. Acquiring a player like Justin Faulk, the 26-year-old three-time all-star, would give the Blues more flexibility in trades involving Pietrangelo. Would the Hurricanes be willing to part with Nečas, Faulk, and a first round pick to acquire Tarasenko? It isn’t an absurd ask, considering Tarasenko’s contract. If the Hurricanes offered it, the Blues would have to consider that package if they have any intentions of trading their star winger. 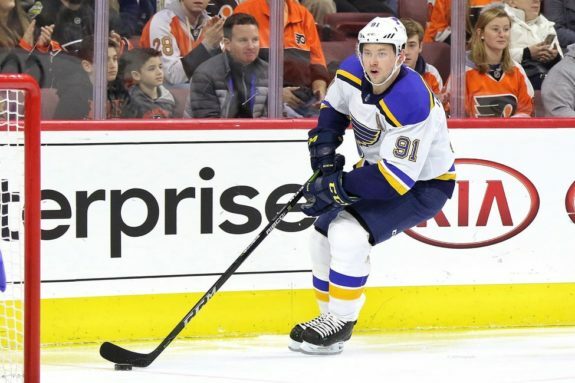 The Boston Bruins might not seem like an obvious suitor for Tarasenko, but that hasn’t stopped NBC Sports in Boston from making their case for a trade. They have probably the best line in hockey when healthy with the unstoppable trio of Brad Marchand, Patrice Bergeron and David Pastrnak, but they could use support behind that. Tarasenko would certainly provide that support, but what would it cost the Bruins? 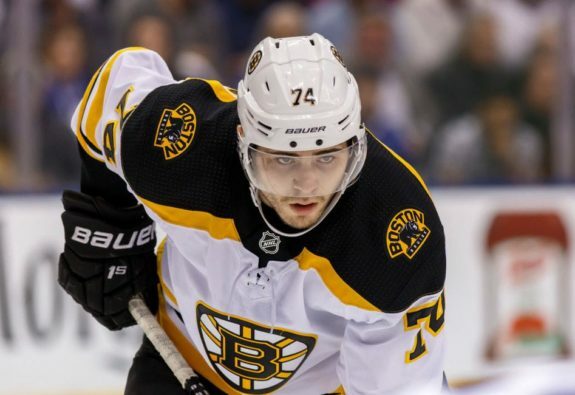 NBC Sports’ proposal centers on Jake DeBrusk, the 22-year-old winger who had 43 points in his rookie season. From there, they speculated that Torey Krug might be of interest to St. Louis. But that doesn’t make much sense as the Blues already have Joel Edmundson and Vince Dunn on the left side of their defense. However, if the Bruins offered DeBrusk and Charlie McAvoy, the young stud defenseman who plays on the right side, it would be a serious conversation starter for Armstrong. McAvoy, like Faulk, would give St. Louis flexibility in potentially trading Pietrangelo, and he is a spectacular young player in his own right. The Blues might have interest in other young players like Ryan Donato or Danton Heinen, but a DeBrusk/McAvoy offer would certainly be a serious start in negotiations. We’ve moved from the realm of “professional” rumors into atmosphere of speculation, trying to identify teams that might be working behind the scenes to make an offer for Tarasenko. In that respect, there is no shortage of potential options, as any team would be thrilled to have a player of his caliber. Here are a few destinations that might make sense. 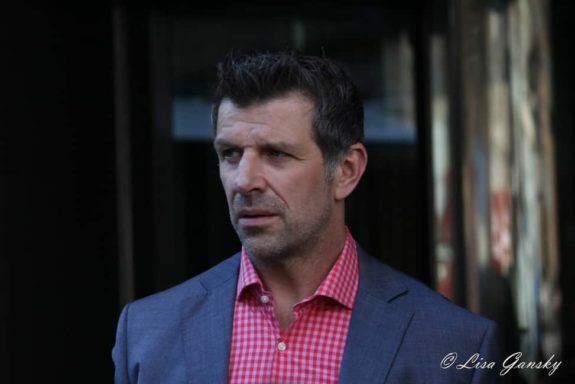 But patience has not always been a virtue of the Montreal market or of Bergevin. Could their interest be piqued by a player of Tarasenko’s caliber, who would help them not only this year, but for many years to come? If the Habs were interested, the package in return would be interesting. Would the Blues be interested in Jonathan Drouin if he were available? They were rumored to be several years ago when they made Kevin Shattenkirk available, but have the years changed that? Would they offer Brendan Gallagher? They probably would not as his character, style of play and contract are valuable, but if they would, the Blues would likely jump at the chance. The Canadiens have a good farm system and could offer a first round pick, a top prospect like Jesse Ylonen or Ryan Poehling and other picks or prospects that should be appealing to the Blues. But it would require Armstrong to consent to building for the future with the Tarasenko trade, which hasn’t necessarily been his intention. Another young team performing well is the Buffalo Sabres. They’ve had an incredible boost from Jeff Skinner, who is second in the league in goal scoring after the Sabres acquired him this offseason from the Hurricanes. On the final year of his contract, he won’t be easy to retain: could the Sabres look to add Tarasenko, either as insurance against the possibility of losing Skinner or as the final piece in a deadly top-six? Related: Could the St. Louis Blues and Patrik Berglund Reunite? If the Sabres wanted to pursue Tarasenko, they have two advantages: plenty of resources in both players and picks, and an established relationship with Armstrong after the Ryan O’Reilly trade this summer. The question is how much the Sabres would part with for Tarasenko. Rasmus Dahlin is untouchable and Casey Mittelstadt likely is as well. They still have talented prospects like Alexander Nylander and Brendan Guhle, as well as a number of young roster players. They also have three first round picks this season, including the Blues’ selection. Would Armstrong be tempted by a package that sent them back their first round pick, a prospect or prospects like Nylander and Guhle, plus more picks, prospects or young players? It might lack the top-end impact of some of the other trades in this article, but perhaps the Sabres could put together enough valuable pieces to convince Armstrong to pull the trigger. The Vegas Golden Knights, like the Sabres, are positioned with a bevy of assets and cap flexibility that might make them interested in Tarasenko. But it’s hard to know what the Knights might offer, given the state of flux their roster is in. Golden Knights GM George McPhee is likely still in the process of figuring out who he wants to be a centerpiece of his team going forward. Some of the assets he’s decided not to lock down might be of interest to the Blues, but who might those be? 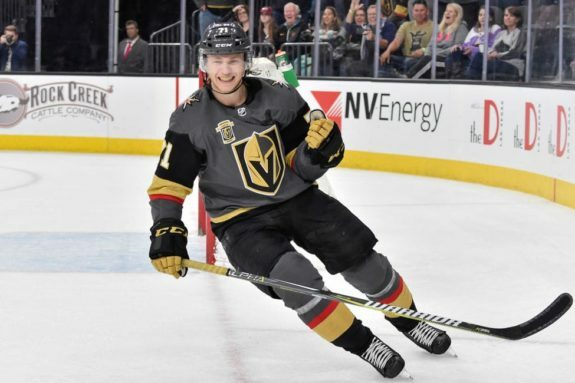 Would Vegas trade Colin Miller? His contract and presence on the right side could provide the Blues the same flexibility as Faulk or McAvoy. 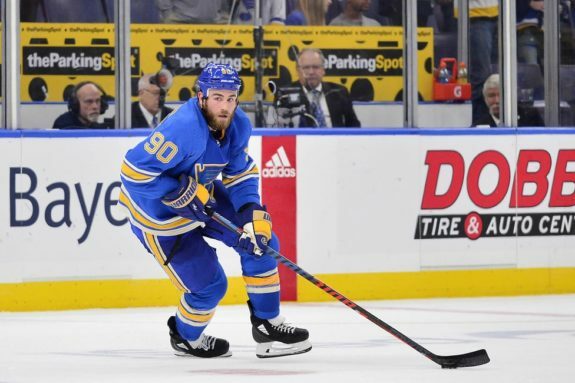 Would they trade Alex Tuch, and would the Blues be interested in taking on that contract? Would they even consider parting with William Karlsson, whom they could not lock down long-term last summer? If not roster players, the Knights have tempting prospects in the likes of Cody Glass and Lucas Elvenes, as well as a number of picks. If McPhee offered a package that included Glass, Miller and a first round pick, it would be hard for Armstrong to say no. One final team we’ll discuss is the always-active San Jose Sharks. GM Doug Wilson has not hesitated to make a move to supplement his team, as he did this summer when he added Erik Karlsson. After a rocky start to the season, the Sharks have found their groove and are now second in the Pacific Division. It would not be out of the question for Wilson to make another blockbuster, particularly if he believes they will not be able to re-sign Karlsson. The question with the Sharks is what they could offer that would tempt the Blues. Ryan Merkley is an interesting prospect who fell in the draft due to concerns about his character. Would the Blues want to avoid such a player given their own locker room issues? 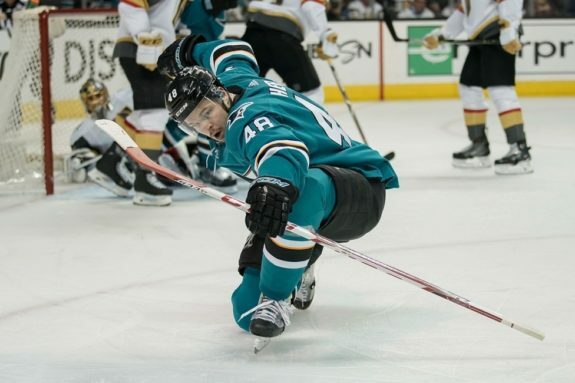 The Sharks don’t currently have a first round pick in either 2019 or 2020, and beyond Merkley, their prospect pool is fairly shallow. We know, according to Friedman, that the Blues once discussed a deal involving Tomas Hertl. Would they still be interested, and would the Sharks part with him? How could they supplement that package, even if the Blues were all-in on Hertl? At the end of the day, there doesn’t seem to be enough that the Sharks can offer to lure a player like Tarasenko free from Armstrong’s clutches. But Wilson has surprised the league in the past. Could he do it again with a blockbuster for the Russian sniper? Beyond the teams discussed, there will be no shortage of suitors for Tarasenko if he really is available. The Blues won’t trade him within the division, but there are 24 other teams that would love to strike a deal for a 40-goal scorer, all things being equal. If Armstrong is serious about making this shakeup, his problem won’t be finding a trade partner, but rather finding the right value to let Tarasenko go. What would you give up for a player like Tarasenko? Let me know in the comments, and come back to The Hockey Writers for all your trade rumor needs!